The beer rules at Oktoberfest are simple but, yeah, strict. Only beer produced by the six main Munich breweries can be sold at Oktoberfest and it’s been this way since year one. These breweries—Augustiner, Hacker-Pschorr, Hofbräu, Löwenbräu, Paulaner, and Spaten—maintain a strict adherence to the reinheitsgebot and are all located within the city limits of Munich. The oldest of these dates back to the year 1328 so… isn’t it about time we got to know them a little better? The Augustiner brewery is Munich’s oldest, having been founded in 1328. That’s almost 700 years ago. How long did you spend at your last job? Exactly. The brewery was established within an Augustinian monastery and supplied beer to the Bavarian royal family until 1589 when Hofbräu was founded. Doth royal beer drinkers know no loyalty? Today, Augustiner is the only Munich brewery to still use wooden barrels for storing beer. You can see this through your very own beer goggles at Oktoberfest where Augustiner is sold in the Augustiner-Festhalle, the Fischer Vroni, and in the Oide Wiesn’s Festzelt Tradition. The Hacker-Pschorr brewery was founded in 1417 and run, mysteriously successfully, by a married couple: Joseph Pschorr and Maria Theresia Hacker. (I guess the beer helped.) Hacker-Pschorr was the leader of all Munich breweries in the 18th century but, after the couple died, was split in two: Hacker and Pschorr, but you knew I was going to say that. The breweries merged again in 1972 and have lived happily ever after in Bavarian Heaven. 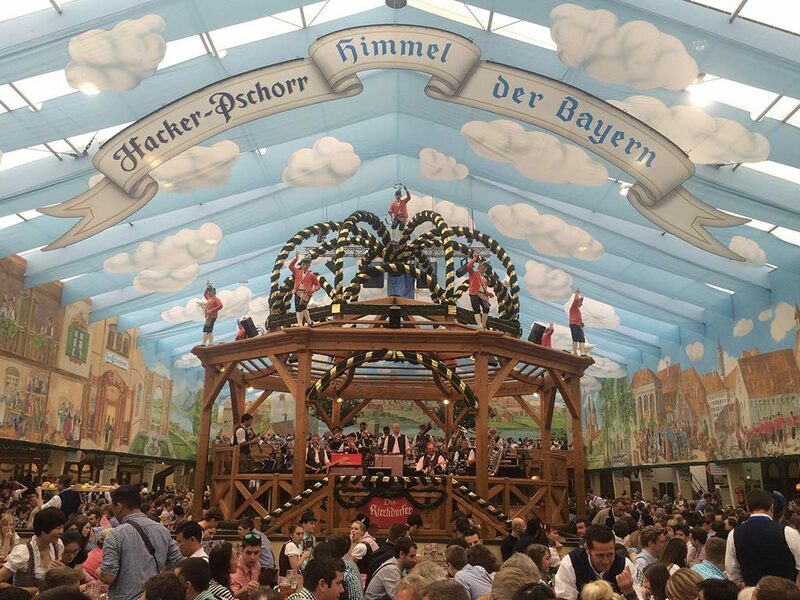 At Oktoberfest, Hacker-Pschorr is sold in the Hacker-Festhalle, the Pschorr-Bräurosl (separate bedrooms, I see), and the Oide Wiesn’s Herzkasperlzelt. As I said before, Hofbräu showed up on the thunder-stealing scene in 1589 and was founded by Wilhelm V, Duke of Bavaria. Do our current politicians have a thing or two to learn, or what? The original brewery was located somewhere you may have actually been—the Hofbräuhaus as we know it today—and, in the 17th century, had a monopoly on wheat beers. I’m picturing a moustachioed gentleman in a top hat raising a ceramic stein, aren’t you? The Hofbräu brewery is currently owned by the state government (aren’t we all, am I right?) and they even have their own Oktoberfest song. At Oktoberfest, you can find Hofbräu being served exclusively in the Hofbräu Festzelt. Oans, zwoa, g’suffa! 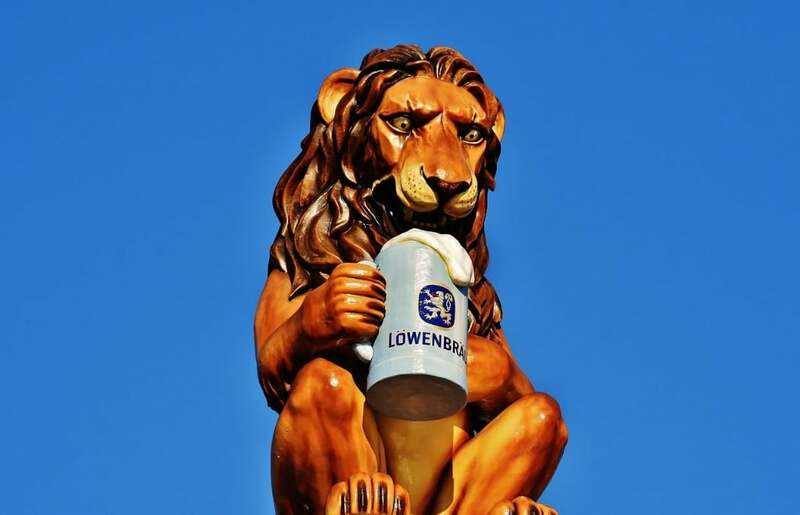 Löwenbräu—meaning “lion’s brew”—was founded around 1383 and has been sold at every Oktoberfest since 1810. Talk about your #ThrowbackThirsty. In 1818 the brewery was bought by a mere peasant (for Heaven’s sake!) and by 1863, had become Munich’s largest brewery, accounting for a quarter of all beer sold in Munich. At the start of the 20th century, Löwenbräu was the largest brewery in Germany. A peasant he was no more. Well, alive no more he was too but good for him! 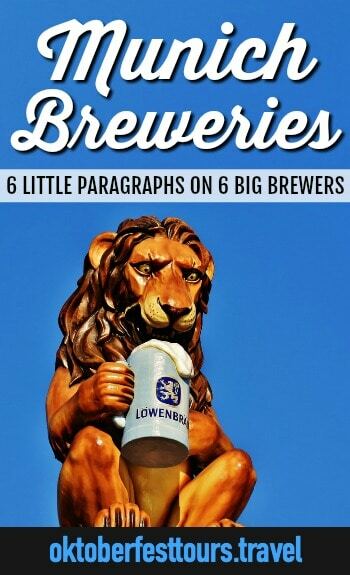 Today, you can find Löwenbräu in the Schützen-Festzelt and the Löwenbräu-Festhalle—just look for the giant, belching lion. At least, I think it’s a belch. Would a roar be more appropriate? Paulaner beer has been brewed since 1634 in the Paulaner monastery, so named for Francis of Paolo, founder of the order. This makes it the youngest of all the Munich breweries at a fresh, rosy-cheeked 384 years old. It was from here that we’ve been blessed with the dopplebock Paulaner Salvator—Latin for “savior”—among many others. It actually is here, at the Paulaner Nockherberg, where the Strong Beer Festival takes place each spring, the beer festival so-named for the Paulaner strong beer. 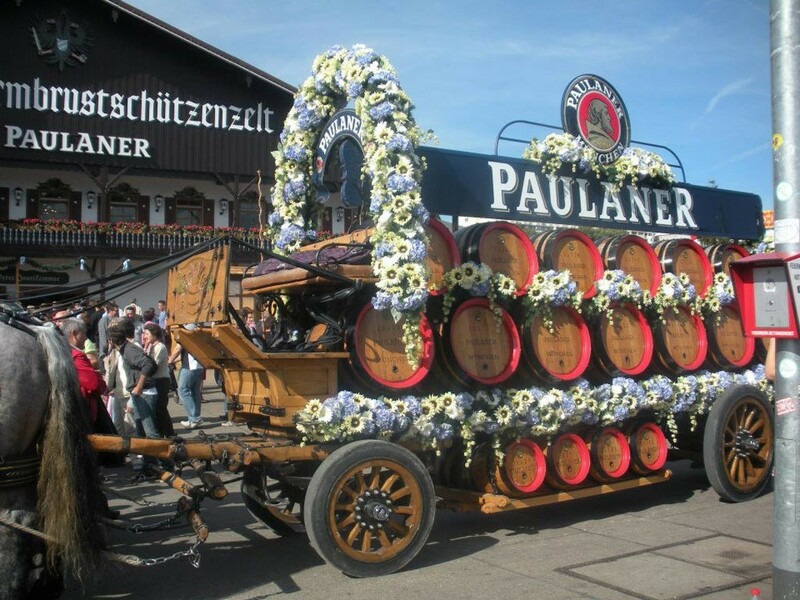 However, at Oktoberfest, you’ll find a much lighter Paulaner being sold in the Paulaner Festzelt (the Winzerer Fähndl), the Armbrustschützenzelt, the Käfer’s Wies’n-Schänke, and the Weinzelt. The beers are rolling in! 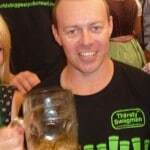 Founded in 1397 by brewer Hans Welser, Spaten means spade and is represented by a malt shovel, since you asked. The brewery has been known as Spaten since 1622 when it was acquired by the Spatt family. The letters GS in the logo refer to Gabriel Sedlmayr, brewmaster of the royal court (obviously), who acquired the brewery in 1807 when it was the wee smallest of all the Munich Breweries. Sixty years later and Spaten is now the biggest of the Munich breweries. (Can you tell what a brewing showdown this town was? Munich’s brewing history reads like the wild, wild west of lager.) 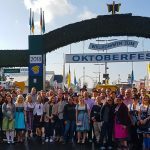 At Oktoberfest, you’ll find Spaten in the Schottenhamel tent, the Ochsenbraterei (Spatenbräu-Festhalle), and the Marstall tent. At high noon. 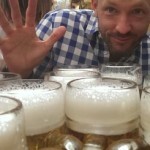 If you’d like to compare all six of these Munich breweries–and I think you should–check out our Oktoberfest tours that take you all around the world’s largest beer festival.